Smart Communications announced it will offer the most advanced iPhones ever. Customers are able to pre-order the iPhone Xs and iPhone Xs Max, starting today at smart.com.ph/Postpaid/iPhoneXs and Smart Stores nationwide. Smart is offering the new iPhones under the data-packed GigaX Plans, which feature separate data allocations for streaming videos, as well as enjoying apps and surfing websites, for a much bigger digital experience. The iPhone Xs is available at Smart for Php3,299 per month for 24 months, inclusive of 15GB (10GB for video streaming, plus 5GB for apps and websites), unlimited texts to all networks, and 60 minutes of calls to all networks every month. On the other hand, the iPhone Xs Max is available at Smart for Php3,599 per month for 24 months, inclusive of 15GB (10GB for videos plus 5GB for apps and websites), unlimited texts to all networks, and 60 minutes of calls to all networks every month. 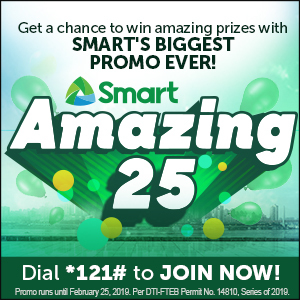 For the complete pricing details, visit smart.com.ph/Postpaid/iPhoneXs. iPhone Xs and iPhone Xs Max are the most advanced iPhones ever, taking the vision for the future of the smartphone to a new level, featuring stunning 5.8-inch and 6.5-inch Super Retina displays that offer remarkable brightness and true blacks while showing 60 percent greater dynamic range in HDR photos. iPhone Xs and iPhone Xs Max bring an improved dual camera system that offers breakthrough photo and video features, A12 Bionic chip with next-generation Neural Engine, faster Face ID, wider stereo sound, longer battery life, splash and water resistance, the most durable glass ever in a smartphone, a beautiful new gold finish that joins silver and space gray, and introduce Gigabit-class LTE for even faster download speeds. iPhone Xs Max offers a more immersive experience with over 3 million pixels for videos, movies and games, offering the largest display ever in an iPhone. Both phones introduce Dual SIM to iPhone through the use of a nano-SIM and digital eSIM. Customers are able to optimize the iPhone Xs and iPhone Xs Max powered by Smart LTE, the Philippines fastest LTE network, according to network testing authorities OpenSignal and Ookla. In its latest report covering the months of May to July 2018, UK-based firm OpenSignal recognized Smart’s lead in terms of LTE download speeds nationwide at 13.09 Mbps, well ahead of the competitor’s 7.34MBps. In July, US-based Ookla, the global leader in Internet testing analysis, cited Smart as the country’s fastest LTE network after analyzing over 2 million user-initiated tests on LTE devices in the Philippines for its Q1-Q2 2018 Speedtest awards. For more details on pricing and data plans, please visit smart.com.ph/Postpaid/iPhoneXs. For more details on iPhone please visit www.apple.com/ph.